KDF LTD is one of the most dynamic and export-oriented Greek companies (currently activated in more than 44 countries in 4 continents), producing and trading a wide range of building materials and complete systems. Among them, our sports materials and systems hold a prominent place. 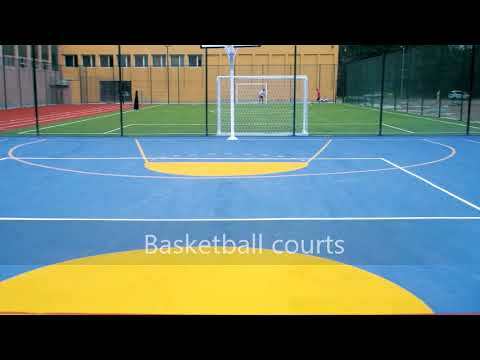 For decades now KDF has been one of the absolute experts in sports flooring in Europe, providing complete acrylic or polyurethane-based solutions for indoor and outdoor sports courts and halls, as well as wet-pour playgrounds, running tracks and PU binder and glues. KDF goes far beyond trade, providing integrated consultancy, marketing and technical support all the way, from the costing till the finalization of the project. Operating under the requirement of ISO 9001/2015 for production, trade and also application, we make sure our products are first applied successfully (and repeatedly) at site by our own people before we launch them abroad. Therefore, our systems have all stood the real life test in different climates, from Middle East till Russia and this is one of our main assets, enabling us to provide full and vertical technical support from specifying to final application plus supervision when required or even full application and costing. We invite you to discover and exploit a world of sports flooring expertise and solutions.